About 80 percent of all scrap tires are handled by retail tire vendors. The remaining 20 percent are handled by auto dismantlers. These two industrial groups, while not the generators of scrap tires, collect and store tires until they are picked up by transporters, sometimes referred to as "tire jockeys". These transporters take the tires to retreaders, reclaimers, and grinders or slitters or to tire disposal sites (landfills, tire stockpiles, or illegal dumps). (1) Figure 1 presents a graphical overview of the scrap tire industry. Figure 1. Overview of the scrap tire industry.Since tires are combustible, tire storage sites can be potential fire hazards. Care must be taken to safeguard against carelessness or accidental ignition, which can occur at tire storage facilities. (7) Tire shreds or chips would normally be available from tire shredder operators. Ground rubber or crumb rubber would normally be available from scrap tire processors There are probably 100 or more tire shredders in the United States, but there are only about 15 to 20 scrap tire processors. Heitzman, Michael, "Design and Construction of Asphalt Paving Materials with Crumb Rubber," Transportation Research Record No. 1339,Transportation Research Board, Washington, DC, 1992. ElGawaday et al. "Mechanical and Environmental Performance of Eco-Friendly Chip Seal With Recycled Crumb Rubber," Prepared for the Missouri Department of Natural Resources, February 2017. Scrap tire rubber can be incorporated into asphalt paving mixes using two different methods referred to as the wet process and the dry process. In the wet process, crumb rubber acts as an asphalt cement modifier, while in the dry process, granulated or ground rubber and/or crumb rubber is used as a portion of the fine aggregate. In both cases, crumb rubber is sometimes referred to as crumb rubber modifier (CRM) because its use modifies the properties of the resultant hot mix asphalt concrete product. The wet process can be used for hot mix asphalt paving mixtures, as well as chip seals or surface treatments. The wet process can also be used to prepare rubberized joint and crack sealants, which are not included in the scope of this document. In the wet process, crumb rubber is blended with asphalt cement (usually in the range of 18 to 25 percent rubber) before the binder is added to the aggregate. When asphalt cement and CRM are blended together, the CRM reacting with the asphalt cement swells and softens. This reaction is influenced by the temperature at which the blending occurs, the length of time the temperature remains elevated, the type and amount of mechanical mixing, the size and texture of the CRM, and the aromatic component of the asphalt cement. The reaction itself involves the absorption of aromatic oils from the asphalt cement into the polymer chains that comprise the major structural components of natural and synthetic rubber in CRM. The rate of reaction between CRM and asphalt cement can be increased by enlarging the surface area of the CRM and increasing the temperature of the reaction. The viscosity of the asphalt-CRM blend is the primary parameter that is used to monitor the reaction. (1) The specified reaction time should be the minimum time, at a prescribed temperature, that is required to stabilize the binder viscosity. When CRM is blended with asphalt cement in the wet process, the modified binder is referred to as asphalt-rubber. To date, most of the experience with the use of CRM in asphalt paving has been with the wet process. Asphalt-rubber binders are used in chip-seal coats as well as hot mix asphalt paving. Chip-seal coat applications using asphalt-rubber binders have become known as stress-absorbing membranes (SAM). When an asphalt-rubber chip seal or SAM is overlaid with hot mix asphalt, the chip seal is referred to as a stress-absorbing membrane interlayer (SAMI). The reported performance of crumb rubber in asphalt pavement has varied widely in different sections of the United States. Several states have had fairly extensive experience in using crumb rubber, some with the wet process. A summary of the experiences of selected states are presented in the next few paragraphs. There have reportedly been six projects in the United States where asphalt pavements with CRM have been recycled. Roughly half of these projects were wet process and the other half were dry process. Apparently, there are no physical problems with recycling reclaimed asphalt pavement containing CRM as a portion of the aggregate in a new asphalt paving mix. Chip Seals (SAM's and SAMI's): Precoated chips must be used and are effective in reducing, but not eliminating, reflective cracking, especially in warmer climates. Asphalt-Rubber Hot Mix Overlays: Improved performance was observed compared with conventional hot mix overlays in most climates. Dense-graded asphalt-rubber overlays may be effective at reduced thicknesses, compared with conventional overlays. Open-graded asphalt-rubber friction courses exhibit improved durability in warmer climates, compared with conventional friction courses. Economic Comparisons: The overall consensus is that crumb rubber modified asphalt pavements may cost 1.5 to 2 times as much as conventional asphalt. Many states have questioned the cost effectiveness of CRM in hot mix asphalt. The initial step in the production of ground or granulated scrap tire rubber is shredding. Scrap tire rubber is delivered to rubber processing plants either as whole tires, cut tires (treads or sidewalls), or shredded tires, with shredded tires being the preferred alternative. As scrap, the rubber is processed, the particle sizing is reduced, steel belting and fiber reinforcing are separated and removed from the tire, and further size reduction is then accomplished. Crumb rubber can be produced by one of three processes. The granulator process produces cubical, uniformly shaped particles ranging in size from 9.5 mm (3/8 in) down to 0.4 mm (No. 40 sieve), which is called granulated CRM. The crackermill process, which is the most commonly used, produces irregularly shaped torn particles sized from 4.75 mm (No. 4 sieve) to 0.42 mm (No. 40 sieve), referred to as ground CRM. The micro-mill process produces a very fine ground CRM, usually ranging from 0.42 mm (No. 40 sieve) down to as small as 0.075 mm (No. 200 sieve). (1) In the wet process, ground CRM is normally used with the McDonald technology and very fine ground CRM is used with the Florida technology. Some of the engineering properties that are of particular interest when rubber is incorporated in asphalt concrete (wet process) include asphalt viscosity, asphalt softening point, resilient modulus, permanent deformation, thermal cracking, and resistance to aging. Viscosity: Adding crumb rubber to asphalt cement can dramatically increase the viscosity of the resultant asphalt-rubber binder. Various quantities of kerosene or other diluents can be used to adjust the viscosity. Viscosity increases can occur after the addition of diluents, but higher percentages of diluent usually result in lowered viscosity increases. Reaction temperatures also affect these relationships. (1) The benefit of increased viscosity of the asphalt-rubber binder is that additional binder can be used in the asphalt mix to reduce reflective cracking, stripping, and rutting, while improving the binder's response to temperature change and long-term durability, as well as its ability to adhere to the aggregate particles in the mix and to resist aging. Softening Point: In addition to modifying binder viscosity, asphalt-rubber binders used in seal coats and hot mix asphalt show an increase in the softening point of the binder by 11°C (20°F) to 14°C (25°F), resulting in reduced rutting or shoving of the asphalt-rubber products at elevated temperatures. Modification of asphalt cement with ground tire rubber greatly increases binder elasticity compared with unmodified asphalt cement, thus providing asphalt-rubber pavement systems with increased resistance to deformation and cracking. Thermal Cracking: Asphalt-rubber binders also exhibit reduced fracture temperatures compared with conventional asphalt cement, usually 5.5°C (10°F) to 8.3°C (15°F) lower, meaning that asphalt-rubber products are less brittle and more resistant to cracking at lower temperatures than conventional chip seals or hot mix asphalt paving. Isolated fatigue studies have also indicated greater resistance to low temperature thermal cracking. In summary, asphalt-rubber is more elastic than asphalt cement and remains elastic at lower temperatures. Resistance to Aging: Laboratory data also indicate that asphalt-rubber mixtures are somewhat more resistant to aging than normal asphalt mixtures. Aging studies performed in asphalt-rubber binders placed in northern and central Arizona pavements indicate that asphalt-rubber binders have an increased resistance to hardening. (1) When crumb rubber is added to asphalt cement, fatigue life is improved. Most wet processes use CRM particles ranging in size from 0.6 mm (No. 30 sieve) to 0.15 mm (No. 100 sieve). The CRM percentage by weight can range from 5 to 25 percent of the binder, but is typically 18 percent. The CRM and asphalt cement are blended at temperatures from 166°C (330°F) to 204°C (400°F). Reaction times may vary from 10 to 15 minutes up to 2 hours or more, with rubber type and gradation being the two most important variables. Conventional AASHTO design procedures for flexible pavements are typically used for pavements containing wet process CRM. (11) Most agencies elect to use the same thickness of asphalt-rubber pavement as the design thickness of a conventional hot mix asphalt pavement. There are a number of special construction procedures for hot mix asphalt pavements containing scrap tire rubber, as well as both chip-seal coats (SAM's) and interlayers (SAMI's). The construction process normally used for hot mix asphalt pavements must be modified in order to produce a quality CRM hot mix. When using asphalt-rubber binders in either dense-graded, open-graded, or gap-graded mixtures, several changes in the normal construction process must be recognized. Crumb rubber is most often shipped in 110 kg (50 lb) bags. The bags can be emptied directly into a reaction vessel for mixing with asphalt cement. The different viscosity of wet-process binders, particularly at the higher rubber content (in the 18 to 25 percent range), can cause problems with storage and/or pumping of the binder. Such problems are most likely to occur if the hot mix plant has been shut down for an extended time period. A blending and reacting unit should be added to ensure proper proportioning of the crumb rubber, base asphalt cement, and any other modifiers. Most wet processes use CRM particles ranging in size from 0.6 mm (No. 30 sieve) to 0.15 mm (No. 100 sieve). The CRM and asphalt cement are blended at temperatures from 166°C to 204°C (330° F to 400°F). Reaction times may vary from 10 to 15 minutes up to 2 hours or more, with rubber type and gradation being the two most important variables. The target temperature should be higher to allow for the greater viscosity of the binder at construction temperatures. Typical mixing temperatures for hot mix asphalt paving are from 149°C (300°F) to 177°C (350°F). Construction of asphalt-rubber chip seals and interlayers (SAMs and SAMIs) is nearly identical to the construction of conventional chip seals. The major differences include the preparation of the asphalt-rubber binder and the use of specialized spray equipment. Crumb rubber is most often shipped in 110 kg (50 lb) bags. The bags can be emptied directly into a reaction vessel for mixing with asphalt cement. For chip-seal or interlayer applications, typical asphalt-rubber spray quantities are 2.5 L/m2 (0.55 gal/yd2) to 3.2 L/m2 (0.70 gal/yd2) for SAM's and 2.7 L/m2 (0.60 gal/yd2) to 3.6 L/m2 (0.80 gal/yd2) for SAMI's, compared with 1.6 L/m2 (0.35 gal/yd2) to 2.3 L/m2 (0.50 gal/yd2) for conventional chip seals. Typical aggregate application rates are in the range of 16 kg/m2 (30 lb/yd2) to 22 kg/m2 (40 lb/yd2) for SAM's and 8 kg/m2 (15 lb/yd2) to 14 kg/m2 (25 lb/yd2) for SAMI's, compared with conventional chip-seal application rates of 11 kg/m2 (20 lb/yd2) to 14 kg/m2 (25 lb/yd2). (1) As with all chip-seal construction, application of the chips should immediately follow application of the binder to ensure proper adhesion. To ensure proper quality control of the CRM binder, the crumb rubber particle size, the rate of addition of crumb rubber, the mixing temperature, and the time of blending and reaction must all be carefully monitored. It is recommended that compacted mixes be sampled according to AASHTO T168,(12) and tested for specific gravity in accordance with ASTM D2726(13) and in-place density in accordance with ASTM D2950. (14) Quality assurance of the chip seal will require that the particle sizing and application rate of the stone chips be closely inspected to ensure compliance with applicable specifications. There are several unresolved issues relative to the use of crumb rubber as an asphalt cement modifier in asphalt concrete using the wet process. Although only a limited amount of air emissions data from asphalt plants producing hot mix containing CRM are currently available, there is no evidence thus far that the use of an asphalt paving mix containing recycled crumb rubber exhibits any increased environmental impact when compared with that of emissions from the production of a conventional asphalt pavement. (10) Nevertheless, there is a need for additional studies on recyclability and worker health and safety issues for CRM asphalt paving mixes. Some of this work is presently underway and, as data become available, they should be incorporated into what is already known concerning these two aspects of using CRM in asphalt pavements. Additional research is needed to define the properties of binders produced by the wet process. Desirable properties for chip seals, interlayers, and hot mix asphalt containing CRM need to be better defined using either existing or newly developed test methods. Epps, Jon A. Uses of Recycled Rubber Tires in Highways, NCHRP Synthesis of Highway Practice No. 198, Transportation Research Board, Washington, DC, 1994. Charamia, Equbalali, Joe A. Cano, and Russell N. Schnormeier. "Twenty Year Study of Asphalt-Rubber Pavements in the City of Phoenix, Arizona." Presented at the 70th Annual Meeting of the Transportation Research Board, Washington, DC, January, 1991. Van Kirk, Jack L. "CalTrans Experience with Rubberized Asphalt Concrete." Presented at the Technology Transfer Session of an Introduction to Rubberized Asphalt Concrete, Topeka, Kansas, January 23, 1991. Page, Gale C., Byron E. Ruth and Randy C. West. "Florida's Approach Using Ground Tire Rubber in Asphalt Concrete Mixtures. "Transportation Research Record No. 1339, Transportation Research Board, Washington, DC, 1992, pp. 16-22. Parcells, W.H. Asphalt-Rubber for Stress Absorbing Membrane to Retard Reflective Cracking. Final Report. Kansas Department of Transportation, Topeka, Kansas, June, 1989. Turgeon, Curtis M. "The Use of Asphalt-Rubber Products in Minnesota." Presented at the National Seminar on Asphalt-Rubber, Kansas City, MO, October 30-31, 1989. Estakhri, Cindy K., Joe W. Button, and Emmanuel G. Fernando. "Use, Availability, and Cost-Effectiveness of Asphalt Rubber in Texas. "Transportation Research Record No. 1339, Transportation Research Board, Washington, DC, 1992. Swearingen, David L., Newton C. Jackson, and Keith W. Anderson. Use of Recycled Materials in Highway Construction. Washington State Department of Transportation, Report No. WA-RD 252.1, Olympia, Washington, February 1992. Emery, John. "Evaluation of Rubber Modified Asphalt Demonstration Projects." Presented at the 74th Annual Meeting of the Transportation Research Board, Washington, DC, January 1995. AASHTO Guide for the Design of Pavement Structures, American Association of State Highway and Transportation Officials, Washington, DC, 1993. American Society for Testing and Materials. Standard Specification D2726-96, "Bulk Specific Gravity and Density of non-Absorptive Compacted Bituminous Mixtures,"Annual Book of ASTM Standards, Volume 04.03, ASTM, West Conshohocken, Pennsylvania, 1996. American Society for Testing and Materials. Standard Specification D2950-96, "Density of Bituminous Concrete in Place by Nuclear Methods,"Annual Book of ASTM Standards, Volume 04.03, ASTM, West Conshohocken, Pennsylvania, 1996. Scrap tire rubber can be incorporated into asphalt paving mixes using two different methods, which are referred to as the wet process and the dry process. In the wet process, crumb rubber acts as an asphalt cement modifier, while in the dry process, granulated or ground rubber and/or crumb rubber is used as a portion of the fine aggregate. In both cases, crumb rubber is sometimes referred to as crumb rubber modifier (CRM) because its use modifies the properties of the resultant hot mix asphalt concrete product. The dry process can be used for hot mix asphalt paving in dense-graded, open-graded, or gap-graded mixtures. It cannot be used in other asphalt paving applications, such as cold mix and chip seals or surface treatments. In the dry process, granulated or ground rubber and/or crumb rubber is used as a substitute for a small portion of the fine aggregate (usually 1 to 3 percent by weight of the total aggregate in the mix). The rubber particles are blended with the aggregate prior to the addition of the asphalt cement. When tire rubber is used as a portion of the aggregate in hot mix asphalt concrete, the resultant product is sometimes referred to as rubber-modified asphalt concrete (RUMAC). The reported performance of rubber-modified asphalt concrete pavements has varied widely in different sections of the United States. The following paragraphs summarize the experiences of selected states with the dry process. In New York, two experimental hot mix overlay projects using granulated rubber in the dry process were installed during 1989 to compare the construction characteristics and performance of rubber-modified asphalt concrete with a conventional top course paving mixture. All overlays were 37.5 mm (1-1/2 in) thick and placed over existing Portland cement concrete pavements, each with a leveling course of varying thickness. On both projects, the rubber-modified mixes consisted of PlusRide with 1, 2, or 3 percent granulated rubber aggregate. (6) After 3 years, the New York State DOT did not consider that these two overlay projects were either economical or successful. Performance of rubber-modified asphalt using the dry process has been mixed, with some early failures. Installations in service for several years generally show little improvement over conventional overlays. Little to no evidence of ice disbonding has been observed, except in laboratory tests. The initial step in the production of ground or granulated scrap tire rubber is shredding. Scrap tire rubber is delivered to rubber processing plants either as whole tires, cut tires (treads or sidewalls), or shredded tires, with shredded tires being the preferred alternative. As scrap the rubber is processed, the particle sizing is reduced, steel belting and fiber reinforcing are separated and removed from the tire, and further size reduction is then accomplished. Rubber used in the dry process is ground rubber that is generally produced in a granulator process. This process further reduces shredded tire rubber and generates cubical, uniformly shaped particles ranging in size from 9.5 mm (3/8 in) down to a 0.42 mm (No. 40 sieve). However, the dry process can also use coarse crumb rubber from the crackermill process, which results in irregularly shaped particles ranging in size from 4.75 mm (No. 4 sieve) to 0.92 mm (No. 40 sieve). Some of the engineering properties of granulated or ground rubber that are of particular interest when used in asphalt concrete (dry process) include its gradation, particle shape, and reaction time. However, a chunk-rubber asphalt process developed for disbonding ice on pavements contains particles larger than a No. 4 sieve with a dominant size of 9.5 mm (3/8 in). Particle Shape: Ground or granulated rubber particles produced from granulators, hammermill, or fine grinding machines have a cubical shape and a relatively low surface area. Coarse crumb rubber particles produced from the crackermill process have an irregularly torn shape and a relatively high surface area. Reaction Time: In the Plus Ride process, there is a relatively short reaction time when the rubber particles and aggregate are mixed with the asphalt cement, so the rubber particles do not have much opportunity to blend with the binder. There is a generic dry process that was developed in New York State, which uses coarse and fine crumb rubber prereacted with a catalyst to achieve optimum particle swelling, and is added at a maximum of 2 percent by total mixture weight for surface courses. (2) In this process, the rubber particles may be able to react to a somewhat greater extent with the asphalt binder. Some of the properties of RUMAC paving mixtures that are of interest include stability, resilient modulus, permanent deformation, and reflective cracking. Stability: Paving mixtures produced by the dry process generally have reduced stability values, regardless of whether the Marshall or Hveem mix design procedures are used. Resilient Modulus: Mixes containing granulated or crumb rubber typically have lower resilient modulus values than conventional hot mix asphalt. RUMAC paving mixes have been found to have resilient modulus values that are 10 to 20 percent higher than those of asphalt-rubber (wet process) paving mixes. 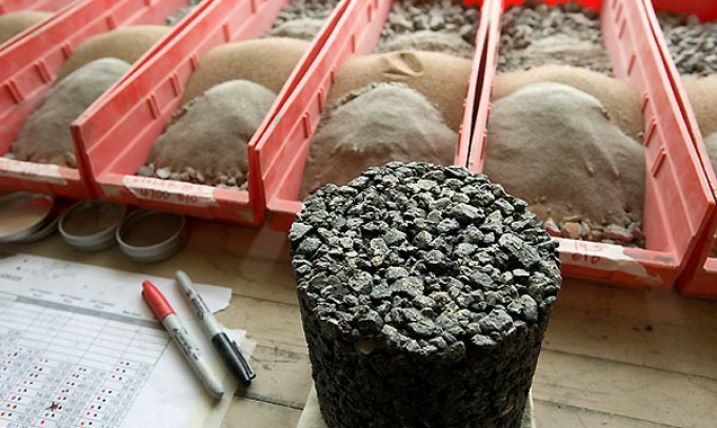 Conventional Marshall and Hveem mix design methods have been used successfully for designing dense-graded mixtures with granulated rubber, but mixtures produced using the dry process typically do not follow the normal mix design procedures. Where stability is the primary design factor in most conventional mixes, the primary dry process design property is the percentage of air voids. The target air voids are between 2 and 4 percent. The method used for the thickness design of rubber modified asphalt pavements, which incorporate between 1 and 3 percent by weight of granulated crumb rubber modifier (CRM) as fine aggregate, is essentially the same as that used for the thickness design of conventional hot mix asphalt pavements. (11) No adjustments are normally recommended in the design thickness of rubber modified asphalt pavements compared with that of conventional hot mix asphalt pavements. When designing asphalt pavements using the structural number (SN), the resilient modulus at 20° C (68° F) is the material property that is considered. Resilient modulus values for 18 percent coarse (2.0 mm (No. 10 sieve)) and fine (0.2 mm (No. 80 sieve)) CRM by weight of asphalt binder in dense-graded mixtures were found to be lower than dense-graded control mixtures at three temperatures ranging from 5° C (41° F) to 40° C (104° F). (12) Since the structural layer coefficient of a pavement is directly proportional to resilient modulus, this would suggest that dry process CRM mixtures should have a lower structural layer coefficient and require some increase in thickness. Both batch and drum-dryer plants have been used to produce RUMAC. The reclaimed granulated rubber is usually packed and stored in 110 kg (50 lb) plastic bags. Additional manual labor and conveying equipment, such as work platforms, are needed in order to introduce the granulated rubber into the paving mix, regardless of the type of mixing plant used. A batch plant has a quality control advantage over a drum-dryer plant because the number of preweighed bags of granulated rubber can be easily counted prior to their addition into each batch. The bags may be opened and the granulated rubber placed on a conveyor, or the bags may be put into the pugmill or cold feed bin if low melting point plastic bags are used. Control of the feeding of granulated rubber is necessary because the correct rubber content is critical to the performance of the paving mix when using the dry process. Such control is more difficult to maintain in a drum-dryer system, due to the nature of the feed operation. 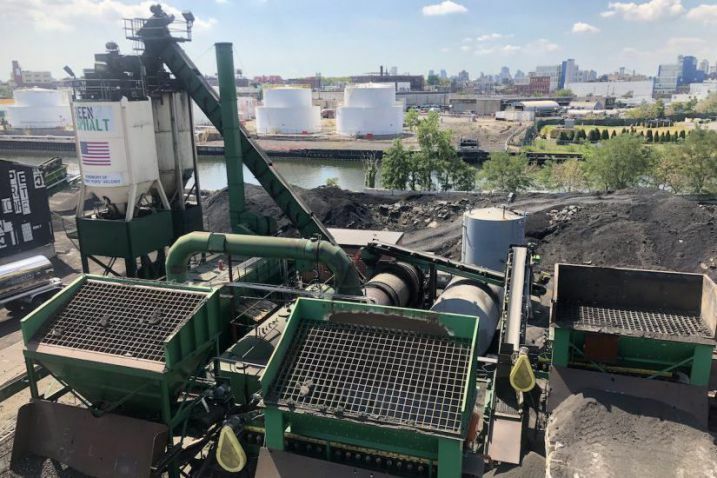 Some drum-dryer plants have used recycled asphalt concrete hoppers to feed the granulated rubber, although a number of agencies recommend that the rubber be introduced into the mix through a center feed system. The process can be automated by the addition of a conveyor and hopper, plus scales to accurately proportion the granulated rubber. For both batch and drum-dryer plants the addition of rubber normally requires that the mixing time and temperature be increased. Batch plants require a dry mix cycle to ensure that the heated aggregate is mixed with the crumb rubber before the asphalt cement application. Mixtures should be produced at 149° C to 177° C (300° F to 350° F). Laydown temperature should be at least 121° C (250° F). A finishing roller must continue to compact the mixture until it cools below 60° C (140° F). Otherwise, the continuing reaction between the asphalt and the crumb rubber at elevated temperatures will cause the mixture to swell. (2) Continued compaction until the mixture cools below 60° C (140° F) serves to contain the expansive pressure of the compressed rubber. Parameters that must be monitored during mixing for dry process mixes include rubber gradation, rubber percent of total mixture weight, rubber prereaction or pretreatment, and time of plant mixing. Since dry process binder systems are partially reacted with the rubber, it is not possible to directly determine the properties of the binders. There are several unresolved issues relative to the use of rubber as fine aggregate in asphalt concrete using the dry process. The overwhelming majority of projects and data concerning crumb rubber use in asphalt paving are from installations using the wet process. As a result, there is a lack of field data to evaluate performance. There have been six projects in the United States where asphalt pavements with CRM have been recycled. Roughly half of these projects were wet process and the other half were dry process. Apparently, there are no physical problems with recycling reclaimed asphalt pavement containing CRM as a portion of the aggregate in a new asphalt paving mix; however, additional field trials are needed. Although only a limited amount of air emissions data from asphalt plants producing hot mix containing CRM are currently available, there is no evidence thus far that the use of an asphalt paving mix containing recycled crumb rubber exhibits any increased environmental impact when compared with that of emissions from the production of a conventional asphalt pavement. (16) Air emission data from a project in New Jersey in 1992 where dry process CRM was recycled as 20 percent of new aggregate in a drum mix plant showed that current air quality standards were not exceeded during the recycling. (16) Nevertheless, there is a need for additional studies on recyclability and worker health and safety issues for CRM asphalt paving mixes. Some of this work is presently underway and, as data become available, they should be incorporated into what is already known concerning these two aspects of using CRM in asphalt pavements. Additional research is needed to define the properties of binders produced by the dry process. Desirable properties for dry process hot mix asphalt mixtures need to be better defined. Heitzman, Michael. "Design and Construction of Asphalt Paving Materials with Crumb Rubber Modifier." Transportation Research Record No.1339, Transportation Research Board, Washington, DC, 1991, pp. 1-8. Epps, Jon A. Use of Recycled Rubber Tires in Highways. NCHRP Synthesis of Highway Practice No. 198, Transportation Research Board, Washington, DC, 1994. Oliver, J.W.H. "Modification of Paving Asphalts by Digestion with Scrap Rubber." Transportation Research Record No. 821, Transportation Research Board, Washington, DC, 1981. Van Kirk, Jack L. "Caltrans Experience with Rubberized Asphalt Concrete." Presented at the Technology Transfer Session of an Introduction to Rubberized Asphalt Concrete, Topeka, Kansas, January, 1991. Turgeon, Curtis M. "The Use of Asphalt-Rubber Products in Minnesota." Presented at the National Seminar on Asphalt-Rubber, Kansas City, Missouri, October, 1989. Shook, James F. Experimental Construction of Rubber-Modified Asphalt Mixtures for Asphalt Pavements in New York State. ARE Inc., Riverdale, Maryland, Report Submitted to the New York State Department of Transportation, May, 1990. Swearingen, David L., Newton C. Jackson, and Keith W. Anderson. Use of Recycled Materials in Highway Construction. Washington State Department of Transportation, Report No. WA-RD 252.1, Olympia, Washington, February, 1992. Emery, John. "Evaluation of Rubber Modified Asphalt Demonstration Projects." Presented at the 74th Annual Meeting of the Transportation Research Board, Washington, DC, January, 1995. Allen, Harvey S. and Curtis M. Turgeon. Evaluation of "PlusRide" (A Rubber Modified Plant Mixed Bituminous Surface Mixture). Minnesota Department of Transportation in cooperation with the Federal Highway Administration, St. Paul, Minnesota, January, 1990. AASHTO Guide for Design of Pavement Structures. American Association of State Highway and Transportation Officials, Washington, DC, 1993. Rebola, Sekhar R. and Cindy K. Estakhri. "Laboratory Evaluation of Crumb Rubber Modified Mixtures Designed using Tx DOT Mix Design Method," Presented at 74th Annual Meeting of the Transportation Research Board, Washington, DC, January 1995. American Society for Testing and Materials. Standard Specification D2950-96, "Density of Bituminous Concrete in Place by Nuclear Methods,"Annual Book of ASTM Standards, ASTM, West Conshohocken, Pennsylvania, 1996. Federal Highway Administration and U.S. Environmental Protection Agency. A Study of the Use of Recycled Paving Material -- Report to Congress. Report No. FHWA-RD-93-147 and EPA/600/R-93/095, Washington, DC, June, 1993. Shredding of scrap tires produces chunks of rubber ranging in size from large shreds to smaller chips. Tire shreds and tire chips have both been used as lightweight fill materials for roadway embankments and backfills behind retaining walls. The shreds or chips can both be used by themselves or blended with soil. Tire shreds normally range in size from 305 mm (12 in) to 76 mm (3 in), while tire chips are usually sized from a maximum of 76 mm (3 in) down to a minimum of 12 mm (1/2 in). Embankments containing tire shreds or chips are constructed by completely surrounding the shreds or chips with a geotextile fabric and placing at least 0.9 m (3 ft) of natural soil between the top of the scrap tires and the roadway. Aside from problems with puncturing of rubber tires on haul vehicles by the exposed steel in tire chips or shreds, there have been no other construction-related problems on scrap tire embankment projects. Adequate compaction, which is always a prime concern on any embankment project, is of even greater concern on a tire shred or chip embankment project, where it is known that some consolidation will occur. Some cracking of the roadway above a tire shred or chip embankment is possible because of long-term settlement or differential settlement. Scrap tire embankments that have been constructed to date have remained structurally stable; however in 1995, three shredded tire projects experienced combustion problems. Two of these projects were located in Washington State. The other project was located in Colorado. Preliminary assessments indicate that the combustion process may have been initiated by heat released either by the presence of organic soils and microbial degradation, the oxidation of exposed steel wires, or microbes consuming liquid petroleum products that could have been spilled on the tire shreds during construction. (2) The presence of both sufficient air and crumb rubber particles in the embankment may have played a role in the process. The crumb rubber in the presence of air may have ignited when exposed to the heat generated in the embankment, initiating the combustion process. Some of the properties of tire chips or shreds that are of particular interest when they are planned for use in an embankment or backfill include particle size and shape, specific gravity, compacted unit weight, shear strength, compressibility, permeability, and combustibility. Due to the differences between tire shreds or chips and stone or soil-like embankment materials, physical characterization of tire shreds or chips represents a specific challenge to the tire user. Particle Size and Shape: Tire chips are normally somewhat uniformly sized and will most often range in size from 25 mm (1 in) to 50 mm (2 in). Tire shreds are more well-graded, usually ranging from 101 mm (4 in) to 202 mm (8 in) in size. Some particles may be 305 mm (12 in) or even larger, including some strip-shaped pieces. The most unusual properties of tire shreds are their flat and somewhat irregular particle shape and their relatively low unit weight. The flat shreds, especially the larger sizes, tend to lay on top of one another and develop some degree of particle interlock. They also tend to be oriented parallel to the horizontal shear plane. Particle size distribution can be determined by performing a standard sieve analysis using the procedures of ASTM D422. No modification of the standard test method is required, except that tire shreds larger than 76 mm (3 in) cannot be screened through standard sieves. Compacted Unit Weight: Depending on the size of the chips, compacted unit weights can range from as low as 322 kg/m3 (20 lb/ft3) to as high as 725 kg/m3 (45 lb/ft3). (4) Tire shreds or chips have a maximum density that is approximately one-third to one-fourth that of typical earthen fill material. The coarser the size of the scrap tire particle, the lower the compacted unit weight. Shear Strength: Limited direct shear testing of tire chips has been performed using a specially made large-scale direct shear testing apparatus. The friction angle of tire chips from these tests ranged from 19° to 25°. Cohesion values range from 7.6 kPa (160 lb/ft2 ) to 11.5 kPa (240 lb/ft2), although significant deformation was required to develop cohesion. Tire chips with a greater amount of exposed steel belts tend to have a higher angle of internal friction. (5) Typical granular soils have friction angles between 30° and 40° with little apparent cohesion. Compressibility analysis of tire chips indicates that the Young's modulus of tire chips is 2 to 3 orders of magnitude less than the modulus of granular soil. The values of Young's modulus for tire chips range from 770 kPa (112 lb/in2) to 1250 kPa (181 lb/in2). Therefore, at least 0.9 m (3 ft) of conventional soil is required to be placed on top of a layer of tire chips in order to prevent or minimize surface deflections. Compressibility can be analyzed by applying a vertical load to compacted tire chips (5 layers, 60% of standard Proctor effort) within a 305 mm (12 in) diameter by 305 mm (12 in) long schedule 40 PVC pipe equipped with horizontal and vertical strain gauges. The strain gauges record horizontal and vertical stress and strain readings at 10 second intervals. Readings are plotted on stress-strain curves. The slopes of these curves are indicative of the compressibility of tire chips and the coefficient of lateral earth pressures. Combustibility: Although scrap tire particles (shreds or chips) are not in and of themselves capable of spontaneous combustion, it does appear to be possible that, under certain circumstances, an initial exothermic reaction may occur within a tire shred or tire chip embankment or backfill that could eventually raise the temperature within the fill to a point where ignition could possibly occur. Tire chips can be mixed or blended with soil. As the percentage of soil is increased, the unit weight of the blend increases. To simplify blending in the field, mix ratios are usually prepared on a volumetric basis. A maximum 50:50 tire chip to soil ratio is suggested so that tire chip usage is not reduced too greatly. However, if the unit weight of the fill is not a concern, then even small percentages (10 to 25 percent) of tire chips can be blended into the soil. This could improve the compactibility of the fill. Since tire chips and shreds are unlike conventional materials, special empirical design procedures must be considered. The principal design considerations include shred or chip containment, shred or chip particle size distribution, particle shape, type of belt, compacted density of the tire chips, and whether soil will be mixed with the chips. To contain tire shreds or chips, a geotextile fabric should be placed beneath the shreds or chips and wrapped around and above them. The geotextile must completely enclose the tire shreds or chips in order to provide the necessary containment. Although smaller size tire chips have an angle of repose of around 50°, 2:1 side slopes (horizontal to vertical) are recommended. (4) At least a 0.9 m (3 ft) soil cover should be placed between the top of the enclosed tire chip fill and the base of a pavement to reduce deflections and to minimize differential settlement within the fill. If heavy wheel loadings are anticipated, an additional 0.6 m (2 ft) soil surcharge can be placed, which can be removed following appropriate settlement prior to pavement construction. The site of the embankment should be prepared in essentially the same manner as though common earth were being used for fill material. If there is a high water table or swampy area that will be at the base of the embankment, it may be advisable to construct a drainage blanket. If there is a natural flow of runoff through the area where the embankment is to be constructed, provisions should be made to pipe the runoff beneath the embankment. When tire shreds or chips are to be blended or mixed with soil, the mixing should be performed volumetrically, using bucket loads from a front end loader and blending the materials together as well as possible with the bucket. As another option to the mixing of tire shreds or chips and soil, alternate layers of the tire shreds or chips and the soil can be constructed. Once the base of the embankment has been prepared, the geotextile that will enclose the tire chips should be placed. A nonwoven geotextile fabric is recommended. Sufficient length should be provided to completely wrap around the tire chips once they have been placed and compacted. Once the bulldozer is able to pass over a layer of tire chips with little to no noticeable deflection or movement under the tracks of the bulldozer, the next layer or lift of tire chips can be placed. There is really no practical method at this time for performing an in-place density test on a layer of compacted tire chips. The best way to ensure that the layer has been sufficiently compacted before placement of the next layer is to continue passes of the bulldozer over the tire chips until there is no more movement of the tire chips when the bulldozer passes over them. The top layer of a tire chip embankment should be kept at least 1 m (3 ft) below the base or subbase layer of the pavement that will be on top of the embankment. Each layer of a tire chip embankment must be fully compacted before the next layer is placed. When the top layer of tire chips has been fully compacted, the sides and top of the tire chips should be fully wrapped and enclosed by the geotextile. A minimum of 0.9 m (3 ft) of compacted soil (preferably granular soil) should be placed on top of the geotextile and tire chips. The soil should be compacted in thinner layers 15 mm (6 in) to 305 mm (12 in) in thickness. The tire chip embankment will experience further deflection during placement and compaction of the soil cover. At least 0.6 m (2 ft) of soil should also be placed on the side slopes of the embankment to cover the geotextile wrap. The soil on the slopes should be compacted to the extent possible, covered with topsoil, and seeded to establish erosion control protection. The additional soil cover on the side slopes will also help minimize the potential of exothermic reactions occurring within the scrap tire embankment. There is little in the way of field quality control testing that can be done during the construction of a tire chip embankment, other than to very closely inspect the compaction of each tire chip layer to ensure that there is very little to no movement under the passage of a bulldozer before proceeding to install the next layer of chips. However, the overall settlement or deflection of a tire chip embankment can be monitored over time by the installation of settlement plates or platforms, slope indicator devices, and bench marks along the slopes of the embankment and within or adjacent to the roadway. Periodic readings should be taken using these devices in order to keep track of the extent and rate of settlement and to compare actual settlements with predicted settlements. One of the principal questions concerning such use of shredded scrap tires is that of an optimum particle size and shape of the tire shreds or chips. More information is needed on the basic types of tire shredding machinery currently in use and their effect on particle shape and size. The effects of mixing or blending various size shreds or chips within an embankment also need to be further evaluated in terms of resultant engineering properties, optimum gradation of shreds or chips, compaction and settlement behavior, as well as potential combustibility. Another consideration that warrants further investigation concerns the blending of soil and tire chips or shreds. Among the variables that need to be further investigated are the effect of various proportions of tire chips and soil on the engineering properties of the resultant composites, especially the bulk density and compaction characteristics. The type of soil is another variable that will influence the bulk density and compaction characteristics of the tire chip-soil blends. If possible, optimum proportions of tire chips and soil should be identified for different tire particle sizes and/or soil types. There is currently very little in the way of field quality control testing that is now being done during the construction of a tire chip or tire shred embankment, other than visual inspection of movement or settlement of the tire chip or shred layers under compaction machinery. Some rational methods of in-place density and/or compaction percentage measurement need to be developed and field tested to help minimize settlement of tire chip or tire shred fills under traffic loading. Collins, Robert J. and Stanley K. Ciesielski. Recycling and Use of Waste Materials and By-Products in Highway Construction. National Cooperative Highway Research Program Synthesis of Highway Practice No. 199, Transportation Research Board, Washington, DC, 1994. Humphrey, Dana N. Investigation of Exothermic Reaction in Tire Shred Fill Located on SR100 in Ilwaco, Washington. Report prepared for Federal Highway Administration, Washington, DC, March, 1996. Epps, Jon A. Use of Recycled Rubber Tires in Highways. National Cooperative Highway Research Program Synthesis of Highway Practice No. 198, Transportation Research Board, Washington, DC, 1994. Bosscher, Peter J., Tuncer B. Edil, and Neil N. Eldin. "Construction and Performance of a Shredded Waste-Tire Test Embankment." Presented at the 71st Annual Meeting of the Transportation Research Board, Washington, DC, January, 1992. Humphrey, Dana N. and Thomas C. Sandford. "Tire Chips as Lightweight Subgrade Fill and Retaining Wall Backfill." Proceedings of the Symposium on Recovery and Effective Reuse of Discarded Materials and By-Products for Construction of Highway Facilities, Federal Highway Administration, Denver, Colorado, October 1993. Humphrey, D.N., T.C. Sandford, M.M. Cribbs, and W.P. Manion. "Shear Strength and Compressibility of Tire Chips for Use as Retaining Wall Backfill." Presented at the 72nd Annual Meeting of the Transportation Research Board, Washington, DC, January, 1993. Ahmed, Imtiaz and C.W. Lovell. "Rubber-Soils as Lightweight Geomaterials." Presented at the 72nd Annual Meeting of the Transportation Research Board, Washington, DC, January, 1993. Upton, Richard J. and George Machan. "Use of Shredded Tires for Lightweight Fill." Presented at the 72nd Annual Meeting of the Transportation Research Board, Washington, DC, January, 1993. Newcomb, David E. and Andrew Drescher. "Engineering Properties of Shredded Tires in Lightweight Fill Applications." Presented at the 73rd Annual Meeting of the Transportation Research Board, Washington, DC, January, 1994.